The term trophic level refers to the place a particular organism occupies in the food chain. Generally, four trophic levels are recognized in most food chains. Primary producers, which are things like green plants and some kinds of bacteria and algae, are at the bottom of the chain, occupying the lowest, or first trophic level. Apex predators like barn owls generally occupy the highest trophic level in any food chain, although this is somewhat open to interpretation. Primary producers, which in addition to green plants and algae include some kinds of microorganisms, convert air, water and sunlight to chemical energy through photosynthesis, which they pass on to organisms of the next trophic level when consumed by them. 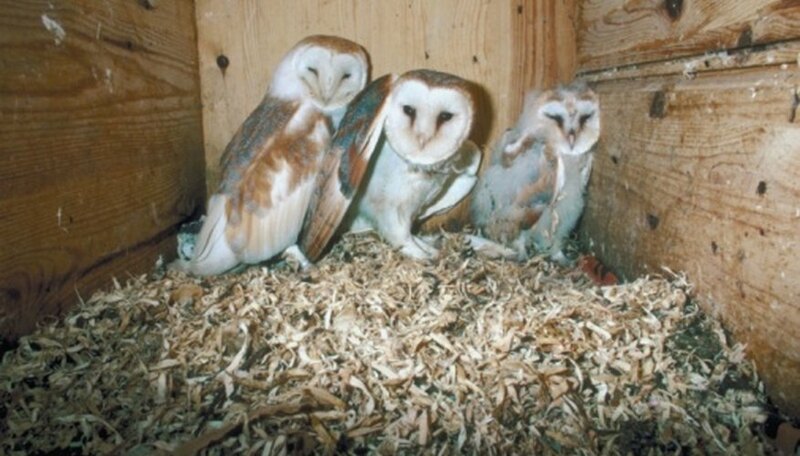 At no point during their development from embryo to adult do barn owls occupy this trophic level. Organisms at the second trophic level are herbivores that consume the primary producers. Many types of animals and insects occupy this trophic level, and as such are called primary consumers. Anything that eats plants fits into this category. Barn owls, as carnivores, never occupy this trophic level. At the third trophic level are predators that feed on the primary consumers. These animals are called secondary consumers. Smaller animals such as voles, birds or mice that feed on insects may be part of this trophic level. Some animals that feed on plant matter as well as insects or other small animals may qualify as omnivores and fit into the second and third trophic levels. Barn owls begin to fit into the food chain at this trophic level, as they feed on animals such as mice, rats and other small rodents. Animals at the fourth trophic level are tertiary consumers and feed on other predatory animals. Barn owls sometimes fit into this trophic level as some of the small animals they feed on may be predatory, such as small birds or voles that feed on insects and small invertebrates. The fifth possible trophic level for a food chain is apex predator. These are predators that feed on other predators and have no natural predators of their own. Depending on the local ecosystem and the complexity of the local food chain, barn owls may fit this trophic level as well, as they have no natural predators. Petersen, Christian. "The Trophic Levels of the Barn Owl." Sciencing, https://sciencing.com/trophic-levels-barn-owl-8654782.html. 24 April 2017.